PALM HARBOR, Fla. — A big change is in store for drivers who use US 19 near County Road 39 in Palm Harbor. The area near the Honda and Mini Cooper car dealerships has seen hundreds of crashes, especially involving left hand turns. Tuesday afternoon, FDOT closed off the northbound turn lane that drivers used to make from US 19 to County Road 39, which leads to Belcher Road. 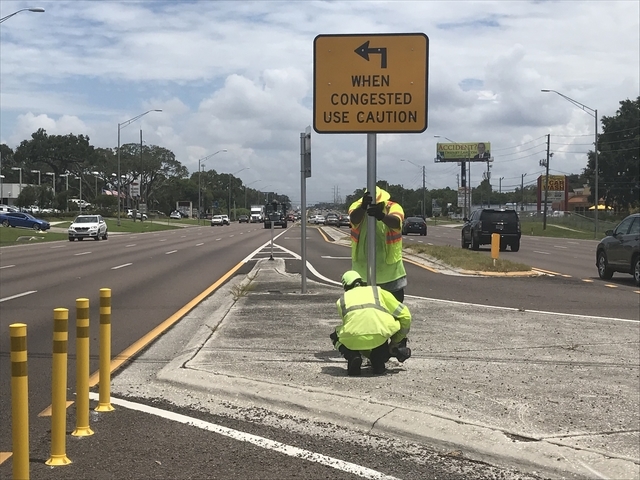 On Wednesday, FDOT crews removed the signs, telling us crash numbers did not decrease after the signs were posted. FDOT says from a review for the past 5 months that the signs were up, found five NB left turn crashes with vehicles in the SB right lane. There were also another seven NB left turn crashes with vehicles in the SB right lane. FDOT says the persistent coverage from ABC Action News along with crash data encouraged them to restrict left-hand turns at the intersection. Drivers tell us they have seen “countless” T-Bone accidents at the intersection and are thrilled with the change. Some express concerns that not allowing left-hand turns could force drivers to make a dangerous U-turn one block further north on US 19. FDOT says U-turns are still much safer than left-hand turns, which force drivers to make their way through four lanes of traffic. Florida Highway Patrol reports 257 crashes along US 19 in the Palm Harbor/Clearwater area over the past 5 years. Many involve injuries and fatalities. FDOT also plans to add flyovers in this same area within the next couple years, allowing traffic to drive over Curlew Road and SR 580. The overpass and frontage road work is starting in 2020, according to FDOT. In the meantime, some drivers say they would like to see the turn lanes taken out altogether and that is exactly what happened south of Palm Harbor. Traveling in the Clearwater/Countryside area, median turn lanes were taken out and concrete barriers were put up.